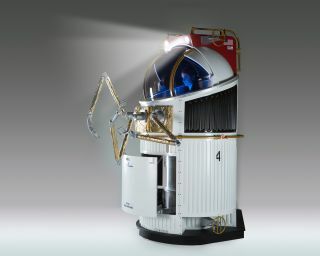 Artist's impression of the single-person spacecraft by Genesis Engineering Solutions. Putting on a spacesuit is one of the most dangerous activities for astronauts. During spacewalks, there is little protection against micrometeoroids, which can puncture the protective suits. Occasionally, the suits themselves suffer failures that can threaten the life of the astronaut. To avoid this dangerous situation, what if astronauts could do activities that normally require a spacewalk with a maneuverable single-person spacecraft instead? That's the vision that the Maryland-based company Genesis Engineering Solutions suggests could work for future missions, including missions to NASA's proposed Deep Space Gateway near the moon. In the company's proposed spacecraft design, the vehicle would be attached to the larger station or living space, and all an astronaut would need to do is shinny through the bottom of the spacecraft to get inside it. It would be equipped with little robot arms to do repairs, and lots of fuel to zoom to even distant areas of the space station. Genesis recently completed "fit testing" of its spacecraft design at the U.S. Space & Rocket Center in Huntsville, Alabama. The test involved placing a cage modeled as the spacecraft inside a large pool (to imitate the microgravity environment), and having scuba-diving volunteers in a range of sizes try to fit into the mock spacecraft, stand on its footrests and handle joysticks that control the robotic arms, all while looking through an opening where the spacecraft window would be. The company now is focusing on more "long-lead" items, said project manager Brand Griffin in an interview with Space.com. Engineers are designing the pressurized-crew enclosure, with the aim of building and testing it. They're also planning ground tests of the propulsion system. If the company had all the money in the world, Griffin said, they could have a working prototype doing a test flight in three years. But realistically, their timeline depends on who is interested in the technology. "There are people in NASA that love this thing, and others that don't — we're aware of that," he said. "A lot of times, disruptive change like this [spacecraft] represents comes with a little bit of headwind." This cutaway view of the single-person spacecraft shows the crew enclosure, the servicing systems and an exterior view. But Griffin — who used to work as a senior engineer supporting the Advanced Concepts Office at the NASA Marshall Space Flight Center in Huntsville — is keeping up conversations with NASA. And Genesis is working on the single-person spacecraft project with Sierra Nevada Corp., creators of the robotic Dream Chaser cargo spacecraft that the company is preparing to send to the International Space Station. He also pointed out that over the decades, NASA itself has developed concepts for other types of vehicles like the single-person spacecraft. And he said Genesis is making use of NASA research in its design of the single-person spacecraft. For example, studies on the Skylab space station in the 1970s showed that astronauts tend to adopt a relaxed, almost fetal-like position when floating naturally in microgravity. The single-person spacecraft design makes use of this floating position to make the fit comfortable for future astronauts. Fans of "Star Trek" may remember the 2009 reboot movie "Star Trek." Spock Prime (Leonard Nimoy) is piloting a cute little single-person spacecraft called the Jellyfish when he is drawn into a wormhole that leads to an alternate timeline. Later, the younger Spock from the alternate timeline (Zachary Quinto) pilots this ship onto a collision course with an alien ship. This science-fiction concept of a single-person spacecraft, however, dates back at least as far as the 1950s, Griffin said during a presentation at the Future In-Space Operations (FISO) Working Group seminar on Jan. 18. Wernher von Braun — who is best known for developing the Saturn V rocket that got astronauts to the moon — also envisioned a "bottle spacecraft" that could take single astronauts out into space. Other concepts include the Remora (Bell Labs) in the 1960s, the Scout (University of Maryland) in the 2000s, and even something called the FlexCraft Cherry Picker (from NASA), which Mitchell researched while he was at Marshall. NASA astronaut Bruce McCandless making the first-ever tetherless spacewalk in the MMU "jetpack" in 1984. The MMU allowed astronauts to venture far from the space shuttle; it was even used for satellite repairs. But after the Challenger shuttle explosion killed seven astronauts in 1986, NASA decided the MMU was unnecessary and ended the program, according to Smithsonian Magazine. Although the program is dead, the expertise still exists: MMU astronaut Robert Stewart is among the advisers helping Griffin with development of the single-person spacecraft. Genesis has done its own development for about two years, Griffin said; back in 2016, the companyran a contest to integrate student designs into the spacecraft. Griffin estimates that between his company's investments, advice from students and mentors, and in-kind contributions from entities such as the U.S. Space & Rocket Center, development of the spacecraft has taken tens of millions of dollars so far. Griffin points to many advantages of the single-person spacecraft over a traditional spacesuit. The spacecraft will fit more body types than a spacesuit. 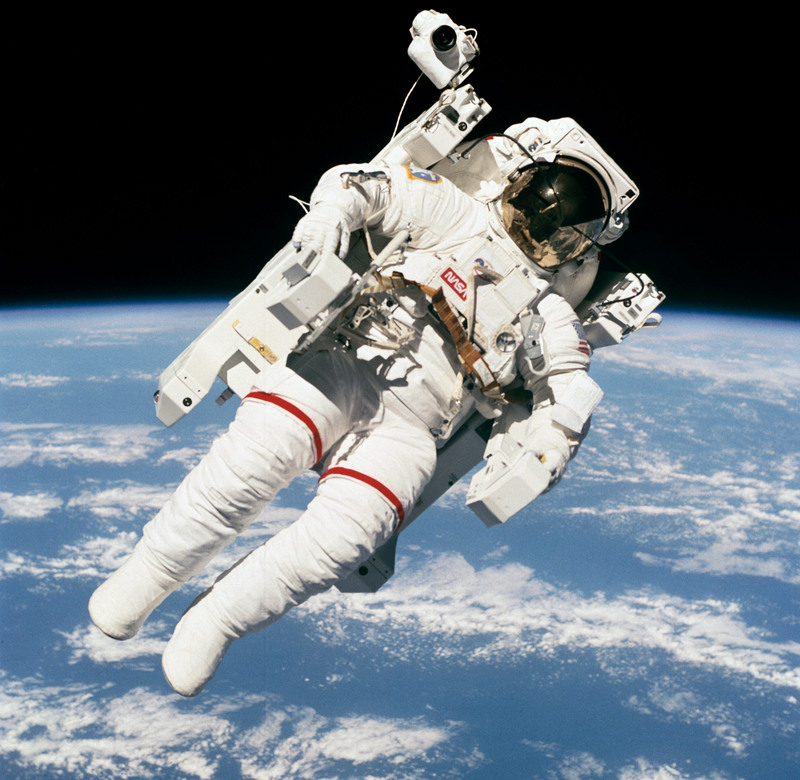 Astronauts can do repairs without injuring their hands, which is a common problem for workers in spacesuits, he added. The spacecraft would also be flexible regarding destination. If astronauts want to go to the moon, the craft could work near the surface and avoid the corrosive lunar dust that can degrade spacesuits over time, Griffin said. Or, it could float by a small asteroid or moon such as Mars' Phobos, which is too small for humans to safely walk on due to reduced gravity. "We're picking and choosing our technology in terms of development," he said. "We'd like to fly a demonstrator — a stripped-down version — and get up there [to space] very soon, and add capability as needed."